Since dogs spend so much time running, jumping, fetching and generally romping indoors and outside, is it any wonder that having healthy paws is so important for a dog's well being? A dog's paw is made up of skin, bone, tendons, ligaments, blood supply, and connective tissue. But as tough as they are, paw pads are not made of armor. "Dogs have some sensitivity to hot and cold but they build up a tolerance much quicker than we do," says Greg Hammer, DVM and former president of the AVMA in Dover, Delaware. "If you have an inside dog and you never walk that dog on hot streets, they are going to blister or ulcerate their feet. It would be just like if we went without shoes." Dr. Hammer adds, "So over time, usage and exposure helps dogs build up the tolerance needed to walk on hot and cold surfaces," and uneven terrain. During the summer months, exercise your dog before sunup or after sundown to avoid pad blistering and other heat-related conditions. Wintertime presents more issues for dogs with salt on the roads, icy streets and frostbitten toes. To prevent cold weather damage to dog's paws, avoid going outside for long periods of time. Paws allow dogs to move around comfortably on land and in the water. Water dogs, such as retrievers, have webbing between toes to help them swim better in the water. Snow breeds like the St. Bernard and the Newfoundland have large paws with greater surface that allow them to walk steadily and with ease on cold and icy terrain. "If damage occurs to one paw, a dog can still get around, but it will limp. Damage more than one paw and the animal is severely handicapped," explains Chris C. Cowing, DVM., president of the California Veterinary Medical Association in Sacramento, Calif. Dogs thrive on participating in activities just like any other family member. We take them to the store with us, for a hike up the nearest mountain and to the seashore for the weekend with many opportunities for dogs to walk on varied terrain. To keep those very important paws in top shape, you could err on the side of caution and inspect your dog's paws every time they come in from outside to make sure they've not picked up a stick, thorn, or bee stinger in a paw or in-between the toes. 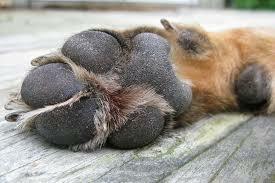 However, if your dog suddenly starts limping, you should examine your dog’s paws immediately. Look between toes, on the top of the foot and between the pads on the bottom of the feet. Does your dog spend an inordinate amount of time licking his feet? If so, this could be a warning sign. Dog owners need to investigate the source of the irritant to determine if there is a particular reason or location of the dog’s attention to its feet. "Some dogs have atopy (allergy) and one of the characteristic signs is when they chew or pick at their paws," says Dr. Hammer. "This can generate a yeast infection called malassezia." So for dogs that are susceptible to contact allergies to certain grasses, washing off the dog’s feet after being outside is a good idea. "Biting and chewing can be a sign of inhalant allergies and the dog needs to be checked by a veterinarian," suggests Dr. Hammer. Breeds that are more susceptible, he says, are Beagles, Bichon Frise, West Highland White Terriers, and Poodles. Dr. Hammer pointed out that if a dog obsessively chews, picks or licks his foot, the dog could have Obsessive Compulsive Disorder. Often called lick granuloma, it's a form of self-trauma where the dog continuously licks a small area, most commonly the paw that becomes raw and inflamed. This behavior is related to stress, boredom or compulsiveness. Excessive licking can damage the tissues further and can also delay healing. So it's a good idea to always check the status of your dog's paws if anything seems out of the ordinary. If you notice that your dog has a minor cut or abrasion on his paw, wash the foot with an antiseptic soap and apply a topical antibiotic cream. Dr. Cowing says, "Deeper lacerations should be examined by a veterinarian. What may appear to be a small wound on the surface actually may be a tendon laceration." It's not unusual for dogs to have cracked or dry pads. If dogs spend a lot of time on rough surfaces such as concrete runs, they will eventually have thickened pads. Dr. Hammer says, "The best thing to do is rub Vitamin E cream into the pad just like you would if you used hand lotion on your own hands. But be sure to rub the ointment in well so the dog doesn't lick it off." 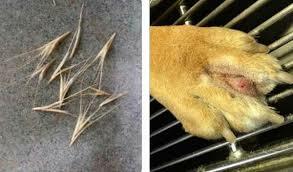 ​Another danger to a dog's paws is foxtails. A foxtail is an arrow-shaped pointed weed that can get under the skin and an abscess. Be on the alert for foxtails if you take your dog hunting regularly. It can be a common occurrence for a dog to have a foxtail penetrate the skin between its toes. Veterinarians sometimes see several cases a week of foxtails that have become lodged in a dog's paw. It can be a very uncomfortable situation for a dog that tangles with a foxtail until it's removed and he could develop an infection in his paw. When it comes to a dog's nails and how often they need to be trimmed, it depends on the dog's activities. In general, the nails need to be trimmed monthly so that the tip of the nail (length) is roughly aligned with the plane of the pad on the toe. Dr. Cowing explains, "This is a tough question to answer due to variation among different breeds. My Labrador never needed his nails trimmed until he became very old." His dog led an active life and walked on hard surfaces that effectively wore his nails down. To prevent paw injury, here are some tips to keep your dog's paws in tiptop shape. First, watch where you walk your dog. Don’t walk him in areas with glass on the ground or other hazards. When hiking over rough terrain and in the field, watch out for weeds such as foxtails. Second, monitor your dog’s feet during exercise. Dr. Cowing says he's seen a number of dogs who were playing ball with their owners on cement or asphalt and who are brought into his hospital with ruptured blisters on their pads. Finally, examine your dog’s paws thoroughly after ball playing, Frisbee chasing, hiking in the woods and walking in the park. This way you'll avoid any unpleasant surprises and your dog will be at the top of his game with four healthy paws firmly on the ground. Many dogs, especially those of the herding breed love to give chase to fast moving objects, unfortunately this sometimes includes cars! For some dog, nail trimming can be really hard - here is a way you can teach your dog to file her own nails.